I've got a little teaser for you guys tonight. I've had over 10,000 visitors now and I changed something in my profile picture. Kind of like one of those puzzles, What's wrong with this picture? 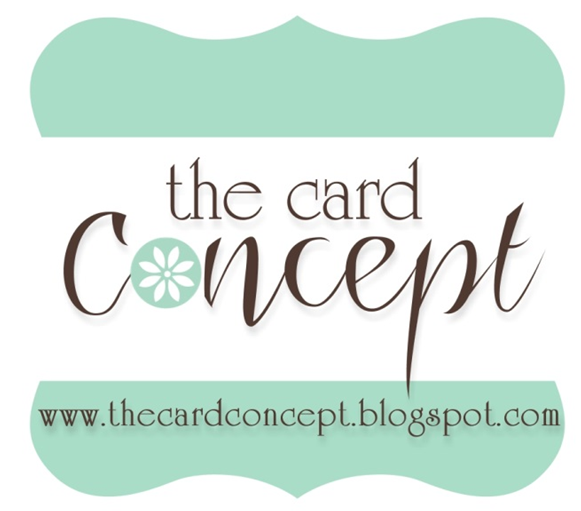 I'm still going to giveaway blog candy when I hit 50 followers, but I decided to draw for some this week also. Leave me a comment about what's different in my picture and I'll have hubby make up a draw hat with your names and he'll impartially draw a winner on 8-20-10. 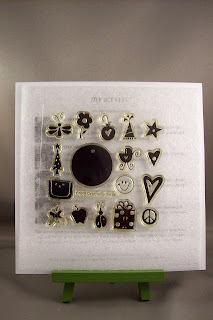 I've got this cute CTMH Celebrations stamp set up for grabs. A little clapping before I get to my card. I won a Top 3 at Raise The Bar Challenge for my Peace Window card and my prize is a guest spot for next Fridays challenge. 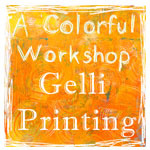 So be sure to check back on 8-20-10 to see what I come up with. When I saw Susan's challenge at 52-Card Pickup was about Solitude this week this is the stamp that immediately came to mind. Who wouldn't like a nice leisurely afternoon under a tree, reading, contemplating, or napping? 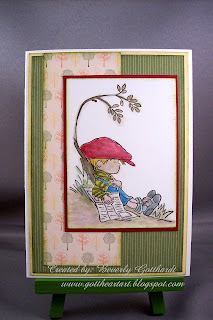 Cute Card Thursday Challenge 125-Tree-mendous! Supplies: Cream Card Blank 4" X 5 1/2" Halcraft, Papers: Stampin Up-Welcome Neighbor Designer Series Paper Pad, Cherry Cobbler, So Saffron, Very Vanilla, Stamp: Lili of the Valley-Lazy Afternoon, Ink: Stampin Up-Early Expresso, Old Olive, Stampin Up markers-Blender pen, Marina Mist, Cherry Cobbler, Crumb Cake, River Rock, Tangerine Tango, Daffodil Delight, Baja Breeze, Pear Pizzazz, Soft Suede, Wild Wasabi, Basic Grey, Blushing Bride. Darling card! Such a cute image. Sorry, I don't know what has changed in your picture. Thanks for joining in with daring card makers this week. Your card is so cute! Really reminds me of lazy summers! Thanks for joining us at JFF this week! Lovely card - sweet image. Thanks for joining in with DCM this week. Thanks for giving a chance to win the candy too. 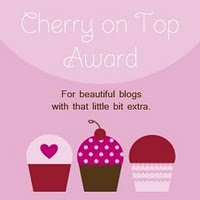 I'm a bit late on my cruising around the blogosphere this week - sorry! Love your card, and this image is so sweet! Thanks for playin'! DARLING image!! I remember summer days spent that way, but it doesn't seem that kids have that "free" time anymore!! Thanks for playing along with JFF this week! I love this cute LOTV chap and you made a great card! thanks for joining us at CCT this week. What a cute card, Beverly! 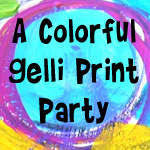 Thanks so much for playing along in the Just For Fun color challenge with us!